Building out a dedicated infrastructure with the agility, scalability, and effciency of a public cloud—while enjoying increased levels of control and security—can help enterprises boost agility and improve operational ef?ciency. However, while most private cloud networking services provide basic load balancing functionality, they lack important application delivery features, putting the performance, availability, and security of applications at risk. 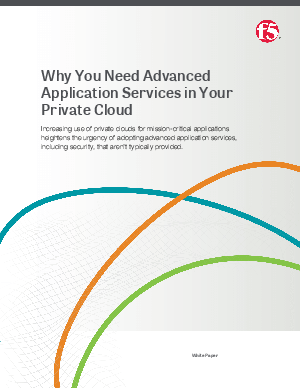 As private clouds increasingly host mission-critical production applications, advanced application delivery services for layers 4 through 7 are becoming essential. End-to-end integration, orchestration, and automation of the needed application delivery networking and security services are also critical to improve application time-to-market and operational ef?ciency.